This chat is the place to have discussions in your flows. All members of a flow will see all chat messages. Comments on team inbox items will also appear in the chat. CA Flowdock allows you to reply directly to or comment on an earlier message. This will turn both your reply and the original message into a conversation thread, as indicated by a colored speech bubble next to both messages. To participate in a conversation thread, just click on the speech bubble to the left of the message, and reply in the conversation view that opens up. Conversation threads make it much easier to follow multiple discussions simultaneuosly. They can also help your team have more conversations out in the open. 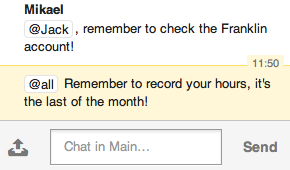 You can get your teammate's attention by @mentioning their name in your messages. If a person is mentioned by name, in addition to highlighting the message, it will also trigger a desktop notification and a notifiction in their notifications list. If they're offline, they will be notified by email. If they have the Flowdock mobile app installed, they will also receive a push notification. These notifications may be switched off from your notification settings. You can notify everyone in a flow with the following special tags. Note: these will not trigger email or mobile notifications. @team is another tag that notifies many people in a flow. It's a way to address the "core team". Users can choose whether they want to be notified for @team on a flow by flow basis. You can think of it as a more courteous way to ask a question than @everyone. Tag messages that you want to easily find later on. Read more about tagging and finding stuff. Use display names (nicknames) to differentiate people with the same name. You can change your display name in your account settings. Autocomplete names: write the first couple of letters of your team member’s display name and press the tab key to fill in the rest. Use line breaks in your message. You can insert line breaks into chat messages by pressing Shift+Enter. Alternatively, you can make Enter add a line break and Shift+Enter submit a message by changing the setting in your preferences. Get better-looking code snippets in the chat. Indented lines will be displayed with a monospace font and whitespace will be preserved. If you preface a (multi-line) paste from the clipboard with a tab, it will be indented automatically. Should you want to indent any text, just highlight it and hit the Tab key. To unindent text, select it and press Shift+Tab. Click on any tag to search. All tags link to search, allowing you to quickly see other messages with the same tag. Use Emojis. All emoji :codes: mentioned in the Emoji cheat sheet are supported by CA Flowdock. If CA Flowdock is missing an emoji, you can add it yourself! Use commands in chat. Type in /status My status here to set your status or /me is doing something to emote. You can also start an Appear.in video chat with a flow's participants with the /appear command. /capslock doesn't do anything useful.